The Wall Street Journal today published Students Stumble Again on the Basics of History. In it they present the familiar lament that many American students are deficient in the basics of American history. 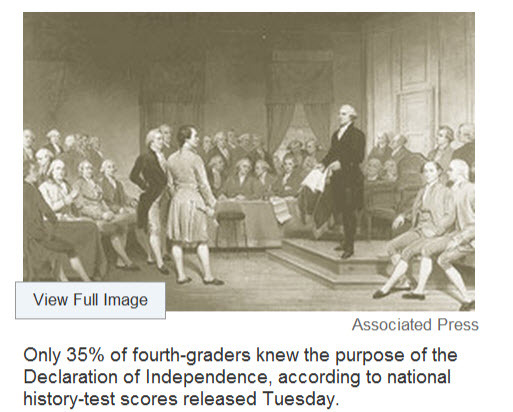 The following picture was used to illustrate how little our students know about the Declaration of Independence. All is not lost, however, these poorly informed students can always get a job in journalism, especially at the WSJ. The above picture depicts Washington presiding over the constitutional convention. He was otherwise occupied when the Declaration was prepared and issued. Not very surprised. I have talked with people with college dergree without a clue about where is Mongolia, or what is the capital of Sweden.